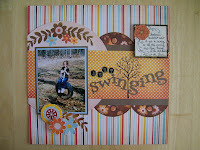 Nice to finally be getting some scrapbooking done. I found this sketch on the Bo Bunny Blog site for the February Sketch challenge. I just happen to have some pictures and of course paper that worked perfectly with this sketch. Autumn loved this tire swing that Grandpa finally got hung in an old oak tree at the farm. We forget sometime the innocence of youth and it is always is so nice to remember. I think that is why I love the farm. We and our family can go their and forget all the stress of our lives and just enjoy running, playing, fishing, hunting or just doing nothing. We have just the bare necessities at the farm since we only go a few times a year. So we have 3 channels on the TV and no phone service. On a good day if you are standing in just the right place outside you may pick up a cell service and remember I said if you are lucky. So nice to be a kid and you know what we can be a kid at any age. Have a fabulous weekend and remember to try to be a kid for a few minutes this weekend. 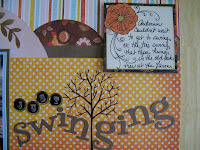 I was off today and got quite a bit of scrapbooking done. Will be posting several new layouts and altered items over the next few days. Decided I would post this one today because it made me happy. Love my grandchildren they always make me laugh even when they aren't here. This Easter layout made me remember how they just followed each other around looking in the same places for hidden eggs. It was so funny and then I thought I am the same way, there are days that I just wander around looking for something and just keep going back to the same place over and over again. I know that I am not the only one that does this. 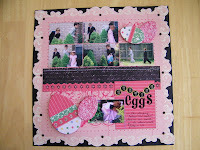 I know you will find this hard to believe but I have very little Easter paper, so this layout was my challenge for the day. I came across some Creative Imaginations and looked on their facebook account and seen they had a really cool layout. So here it is. I did though have to use some Making Memories letters. My eggs are just chipboard die cuts that I covered with paper. It was so easy to get it done. Then with all my computer savvy I decided I would put it in the Creative Imaginations gallery and guess what after 2 or so hours I never did figure it out. So I thought I would post it on their fan page and guess what it went into some sidebar album and out to all of my friends and theirs. Computers, go figure. Hope you all enjoy. My Minds Eye had a layout contest using a sketch. If you have never tried to do your own take on someone elses sketch it can be really challenging. I try very hard to use just the product that is by that manufacturer to challenge myself. The pictures are of my youngest grandchildren and I thought they would be the perfect pictures for the color plalette that the paper offered. I fussy cut the flowers out of the one of the sheets of paper and add Tim Holtz Rock Candy to give the flowers a distressed look plus it makes them firm and easier to work with. I placed brads and buttons in the center of them for added detail. If you have a sewing machine try sewing on your pages; I did around the rose and dot 6 x 8 piece of paper and if you don't try sewing by hand using a paper piercer and some embroidery floss. It is so easy to do and gives great dimension to your projects. If you can believe it I also fussy cut the letters "LOVE" from one of the sheets of paper. I love fussy cutting but remember you need a really good pair of scissors. I like the CutterBee scissors- my favorite. Of course a page isn't complete without a little bling, so I add some of Valentine Crafts Glitter Heart Brads and some stick pins from Making Memories for add accents. I always have friends ask if I have a scrap room and I am very fortunate to have one at the moment. I love it. It's where I can keep all my "special stuff" and I am able to keep everything clean and organized. It is nice because I also have a scrap cabinet that is totally unorganized. I have it in the corner of our living room so I can watch TV with my family in the evening and in the winter it is real cozy to have it next to our fireplace. I find it challenging at times to keep everything in its place with as much room as I have to work in. I love that I have a nice counter that my Cricuit can be use on and a place to store my sewing machine. If you haven't started sewing on your paper creations it is time to start; you can created a great look in a little bit of time with a decorative stitch. I got my black table at a flea market this summer. It is really cool; it has sheep, houses and willow trees painted on it. Great place to scrap when you have friends come over. On my desk I got this great cabinet at "Achievers". Love, Love it!! The cabinet has all kinds of nooks and spots to put more stuff. The closet is full of finished albums on the shelf and has a place that I still keep my tole painting books and some of my supplies for that. I use my painting books now for paper piecing. 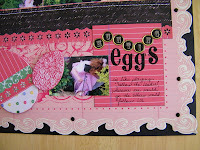 Great way to make embellishments for your scrapbook pages and cards. On one wall inside the closet there is peg board and shelves. Comes in handy for tools that you don't use very often but just knew you had to have when you purchased them. Which I am sure you all have in your closets also. Hate to say it but it also has a lot of shelving in it for books, photos and lots of other goodies. Well there is always a "first" for everything and this is my first. These are the pages I submitted to My Minds Eye for a layout contest. I didn't win needless to say but that is okay. 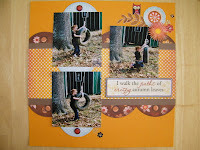 I think some of my problem is over thinking myself and trying to scrapbook like the examples that were shown. I know that is never a good idea, we each have our very unique look on what we want our pages, cards and alter projects to look like. I think I have learned a valuable lesson. I still probably wouldn't have won but would have enjoyed my pages a lot more. The first picture is Sarah and Troy at Christmas when we lived in Alliance NE and my second page is our grandson Isaac at Christmas here in Bartlett TN, he had an attitude and sure didn't look like the "Merry and Bright" caption. The layouts are still cute though and I do love My Minds Eye paper.